One of the Standard Reports in Acctivate is the Monthly Demand Summary report, which shows the demand of a given product, in a given warehouse, over several months. This report allows the user to set an As Of Date in the Selection Criteria, the report will show demand for this product over the past 11 months. This article explains where these quantities come from and what “demand” consists of. 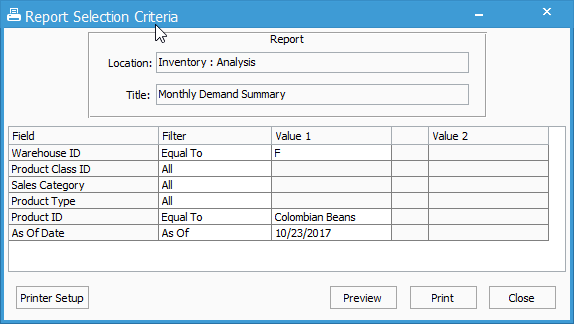 In the screenshot below, notice that the Report Selection Criteria for the Monthly Demand Summary report has been set with a specific Warehouse (F), a specific ProductID (Colombian Beans) and an As Of Date of 10/23/2017. In this next screenshot, we can see the results of the Monthly Demand Summary report with this criteria set. We will focus on the June, July and August numbers for the Colombian Beans product. Notice that the demand in June shows as 0, July shows as 91 and August shows as 1. In the next screenshot, we can see the History tab of the Colombian Beans product. Notice that the Warehouse has been set to the Fort Worth (F) Warehouse. It appears as though this product has been on 3 Sales Orders, 2 WIP (which are Assembly Builds) and a PO. The Demand Quantity on the report is taken from the sum of the Ordered quantity on Sales Orders and the component quantity on the Assembly Builds. The date range is dictated by the Requested Date on the Order and the Transaction Date of the Assembly (WIP). The date range DOES NOT come from the date of the Invoice or the date of the Sales Order (unless the Requested Date is not set). Further, the Demand Quantity will summarize Orders with any status, including Cancelled. It does not matter if the product has been shipped from the order, is on backorder, is on a Cancelled order… The Demand summarizes the Ordered Quantity. Notice that Order A1524T has an Order Date of 6/30/2017, but a Requested Date of 7/10/2017. For this reason, the Ordered Quantity (10) related to that order adds to July on the Monthly Demand Summary report, and not June. Also notice that Order A1524T is in a Cancelled status, but still counts towards the demand in July. Order A1523T has an Order Date of 7/1/2017 and a Requested Date of 7/10/2017, so these 50 also count towards July. Then, WIP session 43-1 posted on 7/20/2017 consumed a quantity of 31.25 in order to build a parent Assembly product. These 31 are also counted towards July. The 10 ordered on A1524T, the 50 ordered on A1523T and the 31.25 required for WIP all make 91, which show for July in the Monthly Demand Summary report. While Order A1525T has an Order Date of 7/28/2017, the Requested Date is 8/7/2017, so the Ordered quantity of 1 on that order counts toward August in the report. Note: If a Requested Date is not set on the Order, the Order Date will be used instead.